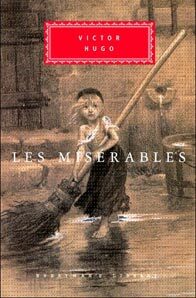 Just finished Les Misérables – all 1700 pages of it. OK, he goes on a bit and some of his sentimentality would make Dickens blush, but what a monumental, magisterial novel. It took him 17 years to write and you can all but feel the blood and sweat and tears on the pages and by the end you remember what’s gone before as you remember your own life – like a dream which you have to remind yourself was real. And I’ve ended up with maybe 100 new French words to add to the vocab!